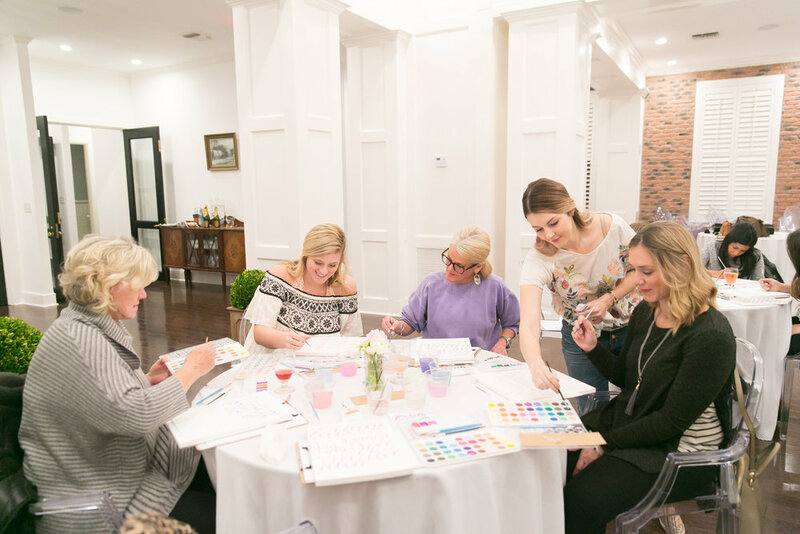 By far, my favorite part of hosting these creative workshops is meeting all of you ladies who come out for an evening of creativity and rest. I keep each workshop small enough that I can learn all of your names, hear about what season you are in, and hopefully even get to have a conversation with you before or after the lesson. I absolutely love hugging each of you and seeing new friendships being formed around the room. It's the truth- women are relational, and it makes my heart to happy to provide a space where we can go to just to spend time and be creative with other women. Maybe it's just me, but when I take time to do that, I always come back happier, more relaxed, and nicer. Because I love getting to know each person that attends, I always make sure to budget time for every lady to go around the table and briefly introduce herself. I love hearing what a wide range of seasons of life are represented. Tired moms with toddlers at home, aching for a break from the noise. Overstimulated nursing students, looking for a relaxing way to pause. New empty nesters, hoping to find a new life-giving hobby. Wives, moms, career gals, students, women in all sorts of walks of life. I know it can sometimes feel like we are surrounded by all these super talented women, all who are more creative, inventive, and artistic than we are. But I am here to tell ya, sister, you were created in the image of THE Creator. We all have a little creative bug in us for that reason. Creativity comes in many forms, so squash comparison before it has time to take root and cause insecurity. You ARE creative. Part of my heart behind Selah Creative Studio is to encourage the creative in you. I believe there is something therapeutic about slowing down and learning a new art form. You can actually sit. Your breaths deepen, your shoulders relax. You can set the stress of tomorrow to the side and focus only on the task in front of you. Set it down when you need to and pick it back up when you need a mini retreat. That is what learning calligraphy has done for me, and it is my hope and prayer that it does the same for you! It is my joy and honor to share what I’ve learned about lettering with you, all with the goal that you would feel refreshed and inspired.